What happens when your sustainable choice might not actually be sustainable? The Luke’s Lobster facility first began processing Jonah crab and selling it in crab rolls five years ago. Since then, the price has just about doubled; Holden says a good-quality Jonah crab now sells for more than a dollar. In the past 15 years, Jonah crab landings have increased by over 600 percent; in 2000, US landings were at 2.6 million pounds, and in 2016, 15.5 million pounds. It’s become a delicacy as well, at least for those who know about it. 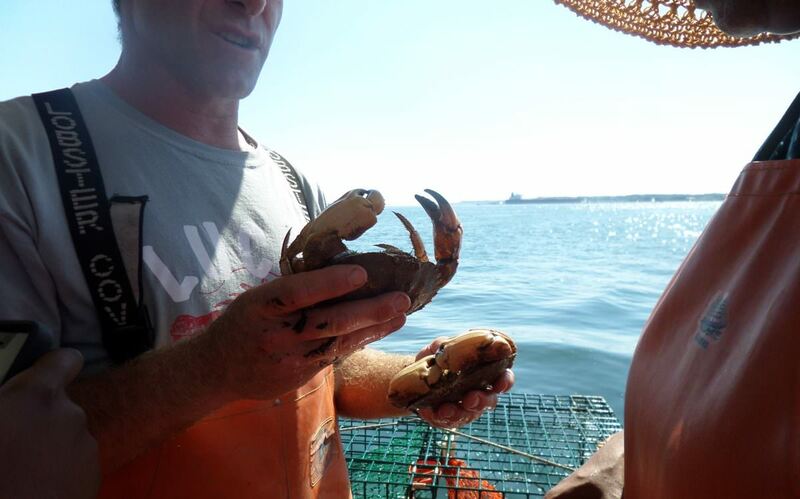 Several people I spoke to in the lobster industry in Maine said the Jonah crab was their favorite seafood item. It’s also great for lobstermen; the peak Jonah crab season is in the middle of winter, from January to March, right when the lobster catch begins to slow down. If the lobstermen can catch Jonah crab during that time, they can score a source of income right when they need it most. Over the past decade or so, as consumers have begun to realize that many of our favorite seafood items – tuna, halibut, cod, shrimp – have some nasty sustainability and labor issues surrounding them, there’s been a push to explore other edible sea creatures. Some of these were formerly considered “trash fish” – fish too bony or oily or just unpopular, eaten by fishermen but not sold to restaurants. The problem with the shifting of focus to newly popular fish like porgy, bluefish, and black cod, is that consumer demand can outstrip regulation. These fish have no history of environmental monitoring; suddenly, there’s money to be made, but nobody quite knows if we’re doing it safely. But the customer’s focus on sustainability has, while also sort of creating this problem, been a catalyst for solving it. “It all starts with what the end user wants; if the end user wants sustainability, that puts pressure on everyone else,” says Holden. In late 2014, a coalition of people involved in the nascent Jonah crab industry got together to hash this all out. That included lobstermen who were catching the crab as well as marine scientists, processors, restaurants, and retailers. What makes this all unusual is how fast the meeting actually got stuff done. By August of 2015, a fishery management plan was ironed out, and by June of 2016, it went into effect. The winter of 2017 was the first time that a Jonah crab season had been conducted with a real watchful eye. The essential problem of the Jonah crab regulation – which is managed by individual states, though now the rules are agreed upon thanks to the plan – is that scientists are studying the crab to find out how it can be safely caught at the same time fishermen are catching it. The initial rules are fairly similar to those for sustainable lobster: a minimum size (a carapace of 4.75 inches wide), egg-bearing females must be thrown back, crab traps must have vents to allow juveniles to squirm out, and fishermen cannot pull the claws off and throw the clawless crab back. At the same time, fishermen must report every single Jonah crab they catch, to help the scientists get a better view of the stocks, and research is ongoing to figure out the precise way the crab fits into the Atlantic ecosystem. This all just goes to show how complex the entire idea of eating sustainably is; as our eating habits shift, our science and regulation has to scramble to keep up. The Jonah crab is an example of this process going about as well as it possibly can: customers and producers coming together to try to actually do things the right way.